NATIONAL HARBOR, Md., (October 3, 2016) – Bringing the first luxury gaming resort experience to the Capital Region, the $1.4 billion MGM National Harbor will make its highly anticipated debut Thursday, December 8, just minutes from Washington D.C. on the banks of the Potomac River. The resort is accepting room reservations for stays beginning December 10 via mgmnationalharbor.com or (844) 646-6847. Nightly room rates start at $399 and suite rates begin at $599. Surrounded by the lush woodlands and rolling riverscape of Prince George’s County, with sweeping views of the capital’s iconic monuments, MGM National Harbor will be a destination distinct to its setting with contemporary and bold architecture and design inspired by the historical region. Accommodations – Clean lines, modern functionality, signature wood millwork accents and floor-to-ceiling windows boasting stunning views define the 308 rooms and suites, ranging in size from 400 to 3,210 square feet. Complementing the resort’s modern elegance, room and suite designs draw inspiration from forest and water elements native to Maryland while incorporating vistas of the surrounding landscape. Culinary Delights – The chef-driven food and beverage program at MGM National Harbor captures flavors of the Capital Region in both upscale and casual dining options. Acclaimed chefs José Andrés, Marcus Samuelsson, and Bryan and Michael Voltaggio each will introduce exclusive concepts to the resort. Delivering the vibe of a gourmet food festival, National Market will boast nine distinct venues inspired by local and global flavors. Pan-Asian restaurant Ginger will serve authentic cuisine from regions throughout Asia, while TAP Sports Bar will offer regionally inspired comfort food to be enjoyed while watching the latest sporting events. Bellagio Pâtisserie, a European-inspired pastry shop reminiscent of its namesake in Las Vegas, will feature a 26-foot-tall chocolate fountain – one of the world’s largest – circulating nearly two tons of sumptuous melted chocolate. Entertainment – MGM National Harbor has partnered with entertainment giant Live Nation for entertainment programming at The Theater at MGM National Harbor, an intimate 3,000-seat venue slated to host the entertainment industry’s biggest acts and events. Complete with VIP suites and reconfigurable seating arrangements, the venue will welcome A-list concerts, comedy shows, UFC fights, boxing matches and other special events. Art – Furthering the rich local flavor of MGM National Harbor through art, the thoughtfully curated Heritage Collection will be woven throughout the resort’s public spaces, featuring commissioned and procured artwork by renowned local and international sculptors, photographers and mixed-media artists including Bob Dylan, Margaret Boozer, Alice Aycock, Ron Beverly, Martha Jackson Jarvis, Sam Gilliam, John Dreyfuss, John Safer, Liao Yibai and Chul Hyun Ahn, among others. Conservatory – Entering the hotel, guests will be welcomed by a stunning two-story Conservatory featuring intricate design elements and vibrant floral combinations masterfully interwoven by famed designer Ed Libby. Certain to become a must-see attraction in the region, the Conservatory will be visible throughout the central portion of the resort and viewable from several vantage points around the property. The display will change five times per year – one for each season plus a dedicated display in celebration of Lunar New Year. Meetings & Events – Available for small private gatherings, engaging meetings and elegant galas, MGM National Harbor will be a premier destination for groups that expect the best in amenities and service. 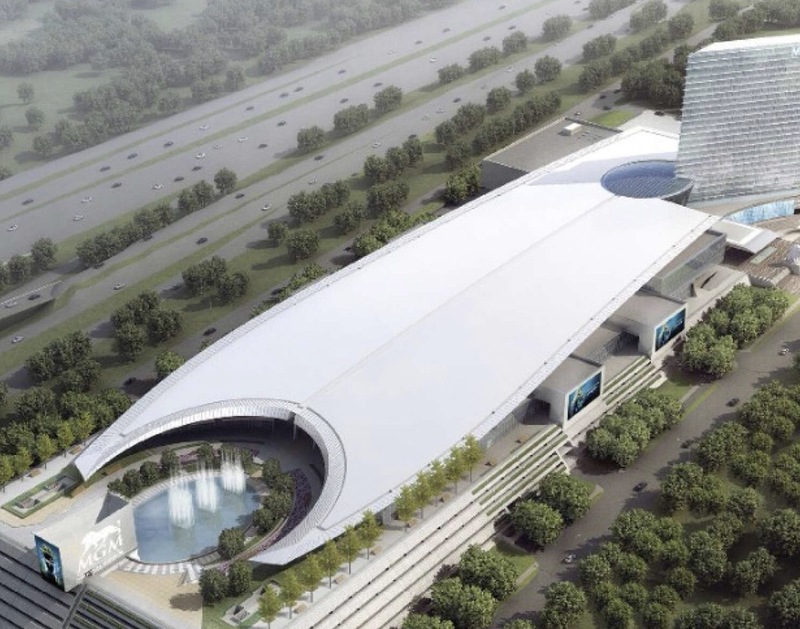 With 50,000 square feet of versatile meeting space, MGM National Harbor Conference Center will include two boardrooms, the 16,200-square-foot MGM Grand Ballroom with floor-to-ceiling windows and a 6,000-square-foot terrace with spectacular views. For unconventional meeting and event locations, the flexible 3,000-seat Theater at MGM National Harbor with VIP suites and scalable chair and table designs, and the outdoor Potomac Plaza with breathtaking views of the nation’s capital, can set the stage for memorable weddings, social gatherings or important business receptions. Potomac Plaza – Fresh air meets breathtaking views on MGM National Harbor’s incredible outdoor plaza, which will feature a beautiful fountain and reflecting pool alongside sweeping vistas overlooking the harbor, Potomac River and the nation’s capital. Nightlife – Clique Hospitality, the trendsetting experts who have defined Las Vegas’ famed nightlife industry for more than a decade, is creating two distinct venues certain to become go-to spots for sophisticated socializing and inventive cocktails. Felt Bar & Lounge is an indoor/outdoor lounge featuring the region’s first tableside mixology program; and Blossom Cocktail Lounge, inspired by Washington, D.C.’s famed cherry blossoms, will be at the center of all the action. Spa & Salon – Guests can replenish their mind, body and spirit through the tranquil offerings within MGM National Harbor’s 27,000-square-foot Spa & Salon. Timeless modern design, minimal ornamentation and light-soaked spaces will create a relaxing experience for guests looking to indulge in a brief respite or an all-day escape. Situated on the corner of the resort, wrap-around windows will feature views of its beautiful natural surroundings. Also capitalizing on the stunning views, a spacious fitness center located adjacent to the salon, will feature a wide variety of cardio machines and free weights, all overlooking the resort’s outdoor pool. Pool – Beginning in spring 2017, hotel guests of MGM National Harbor will be invited to relax and unwind at the resort’s outdoor, heated, infinity-edge pool. Overlooking the resort’s peaceful surroundings, this sophisticated yet energetic setting will offer a respite from the action with lush seating, private cabanas and poolside cocktail service. Casino – More than 125,000 square feet of dynamic casino space will feature poker, a variety of table games and more than 3,300 slot machines to keep the energy going all night. Retail – For those seeking a little retail therapy, MGM National Harbor will feature 18,000 square feet of luxury retail with brands to be announced soon. For additional information and high-resolution images of MGM National Harbor, please visit the MGM National Harbor digital newsroom or follow on Facebook and Twitter. The newest addition to the MGM Resorts International (NYSE:MGM) portfolio, MGM National Harbor’s unrivaled setting offers stunning panoramic views of the eastern shore of the Potomac River in Maryland. The $1.4 billion resort sits a short distance from Washington, D.C. to the north and historic sites, including George Washington’s Mount Vernon estate across the river in Virginia. The 24-story, 308-room resort will feature premier amenities and experiences for locals as well as visitors from around the world including a dynamic casino with over 125,000 square feet of space that includes slots, table games and poker; a world-class spa and salon; an entertainment theater with flexible seating for up to 3,000; high-end branded retail; 50,000 square feet of meeting space; and restaurants from renowned local, national and international chefs. MGM National Harbor is scheduled to open December 8, 2016. Statements in this release that are not historical facts are forward-looking statements within the meaning of the Private Securities Litigation Reform Act of 1995. MGM National Harbor has based these statements on management’s current expectations and assumptions and not on historical facts. Examples of these statements include statements regarding the expected opening date of the casino resort and scope of the amenities to be offered. A number of important factors could cause actual results to differ materially from those indicated in such forward-looking statements, including effects of economic and market conditions, competition with other destination travel locations throughout the United States and the world, and the design, timing and costs of the projects and risks relating to permits, licenses, financings, approvals and other contingencies and additional risks and uncertainties described in the MGM Resorts International Form 10-K, Form 10-Q and Form 8-K reports (including all amendments to those reports) filed with the Securities and Exchange Commission. In providing forward-looking statements, MGM National Harbor is not undertaking any duty or obligation to update these statements publicly as a result of new information, future events or otherwise, except as required by law.